The Connected Living team ensures your home theatre design and experience is as close as possible to the cinematic experience the Movie Director created. Connected Living deal with a huge range of home theatre and cinema products and components to ensure you with the best system possible for your budget. From HiFi components to projectors, custom seating to acoustic treatments, we will ensure optimum theatre performance - all you need is the popcorn! No need to compromise your theatre room. Thanks to automation, technology offers great solutions like TV’s that hideaway in Cabinets, invisible speakers, and the ability to place equipment into racks out of sight. You may want to display a peice of artwork on the wall at most times, and have it automatically reveal a television screen with a TV lift when you want to watch television or a movie. 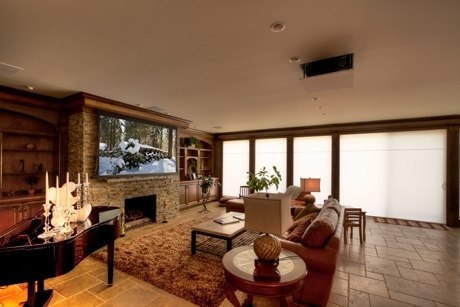 Regular living room lighting can also dim down to give that full movie theatre experience. Acoustic treatment can also be placed into your walls providing sound isolation from room to room. Australia’s great climate allows architects and builders to extend our living space from inside to outside. Connected Living can provide outdoor theatre and cinema products and weather proof speakers allowing you to enjoy your favourite shows outdoors. A single button press on your waterproof remote, your screen reveals itself, and your show starts with amazing surround sound. Don't worry about the sun or rain... the speakers and screens are completely weather proof. Enjoy your outdoor entertainment in any condition.